Well, today starts the COUNTDOWN to our new JULY release from REVERSE CONFETTI! This month, we are debuting 5 new stamp sets and 6 new Confetti Cuts and another original set of Quick Card Panels. We can bet that they will all be your new favorites, so get your wishlist ready! First up on the Sneak Peek stage are two new sets that have coordinating Confetti Cuts dies--LATER ALLIGATOR and WEATHER IT TOGETHER. I made this card using the new LATER ALLIGATOR stamp set and Confetti Cuts that I colored with my Copic Markers. I'm always reminded how much I still love to color when I have a new "image" stamp to work with! 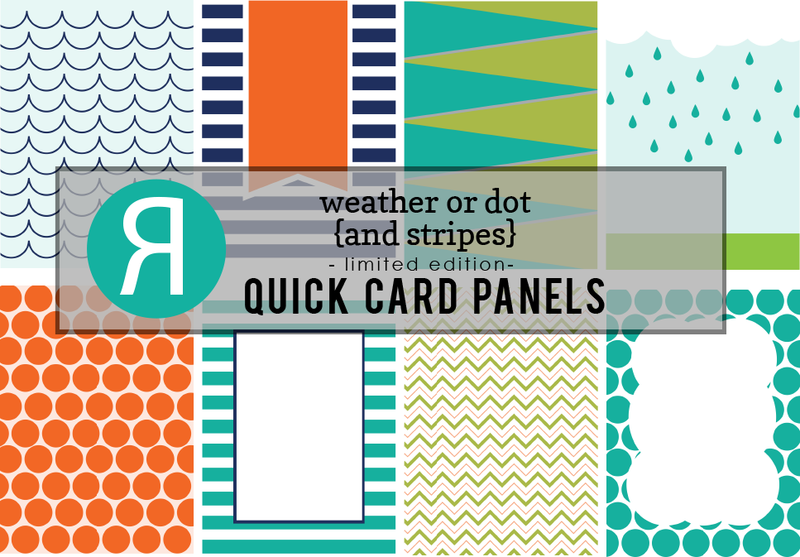 I've layered my alligator and older GEOMETRIC Confetti Cuts atop one of the new WEATHER OR DOT QUICK CARD PANELS. 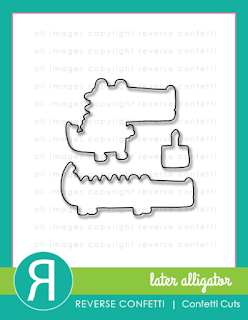 I love those little alligators!!! Next up is a sweet "thinking of you" type card that features the WEATHER IT TOGETHER stamp set and coordinating WEATHER IT TOGETHER Confetti Cuts. 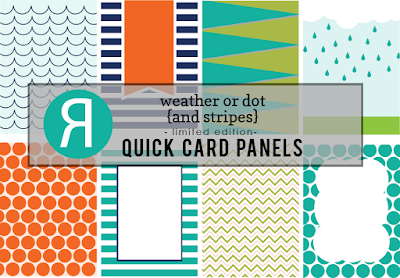 I also layered several things on this card over a new WEATHER OR DOT QUICK CARD PANEL. The sun, cloud and sentiment are part of the stamp set, which by the way has several elements that can coordinate with the LATER ALLIGATOR and other stamp sets already in the REVERSE CONFETTI store. We have lots more sneak peeks to share over the next 2 days. Then, everything will be available on the 8th. Don't forget that Jen has a link list going daily (JULY 5-8) for all the sneak peeks over on the REVERSE CONFETTI blog HERE. Leave a comment on each of the designer's blogs for a chance to win a $15 gift certificate. Comments will close at noon CST on JULY 7th and the winner will be announced at 5pm on JULY 7th on the Reverse Confetti Blog and our Facebook page. In addition to having a chance to win just by leaving a comment on the sneak peek posts, we are also running a Facebook promotion for a chance to win a $15 gift certificate. After you are done checking out the sneak peeks, head on over to OUR FACEBOOK PAGE and look for the promotional graphic. SUSIE Q-TIP: When I stamped the sun, I didn't have an orange pigment ink that would play nice with my Copic markers, so I went ahead and stamped it with a regular Stampin' Up orange ink and just didn't let my Copic ink touch the stamped part. You can see a white space in between the colored edge and the stamped image. Super FUN...I always love all your layers! 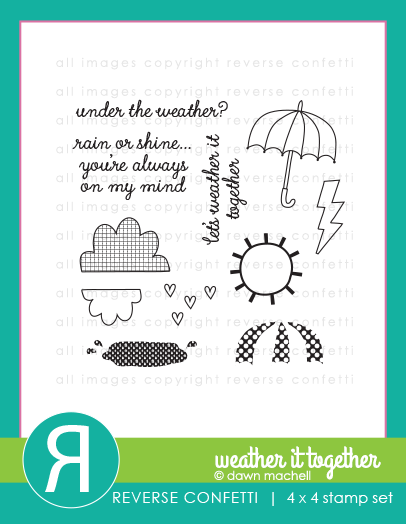 I totally LOVE your layered style -- the fun images work perfect! I need to check out these panels. 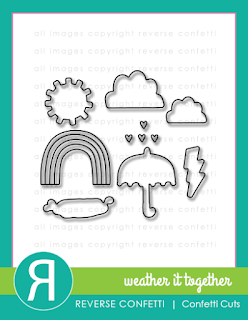 Would be great to have a background panel ready to go when I was making my greeting cards. Your color combos are FAB! I'm loving this gator! Awesome details! I love how layered your cards are and the colors that you used. 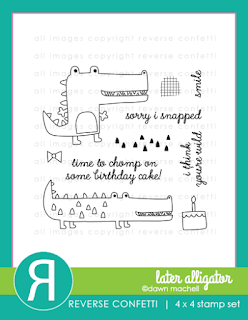 Love the cake on the alligator, so cute. Great projects. Wow! Lots of dimension on these cards. Awesome. You are a master at layering and combining! Fantastic cards!!! 'cake on the alligator' super cute! Adorable cards!! I really like the color combo on your first one! I love all the layers on your second card. Very interesting and fun to "explore". Great card. Your alligator card has a lot going on but all the elements work so well together. Fun projects! So many layers and they all coordinate so well together!!! You did a great job with all the layering! The gator with the cake on his head is so cute! Adorable and colorful and really fun! Love that you used the mosaic background die as I struggle with that one. Super cute fun cards as always. Cute cards and great color combos. Oh cute and such great colors, Susan!